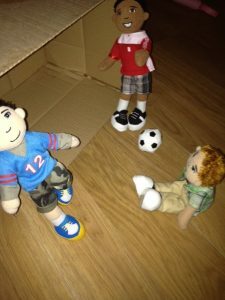 The wonderful people at Play Merrily Toys sent us through some very cool dolls for the boys. They are called Boysterous Dolls. I think it is an excellent idea to have dolls for boys and these dolls are very cool. We were sent Halfpipe Pete who comes with his own skateboard and can do all sorts of stunts. Goalie Gavin, who loves to play football and show off his soccer skills. We were also sent Touchdown Dillon, the quarter back for an American football team, who loves to punt the ball up the field. 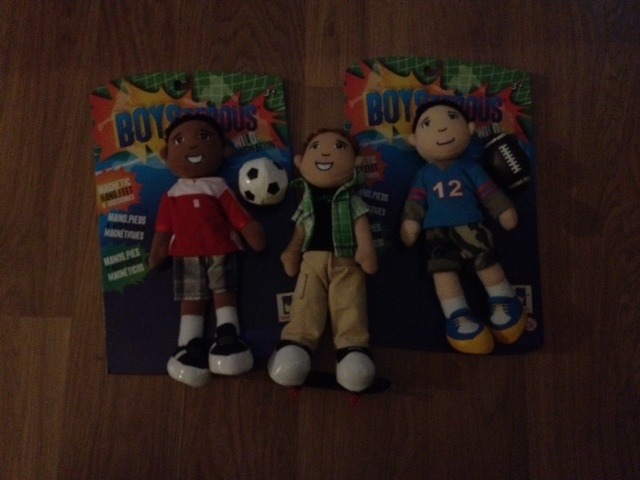 All the Boysterous Dolls have a soft body, magnetic feet and hands. The accessories stick to their hands and feet with ease, allowing the children to play with them and have fun with the ball, skateboard, etc. The bodies are poseable, just like the dolls the girls have. My boys loved having these as they have twin cousins who are five and always love playing with their dolls, now they have their own. 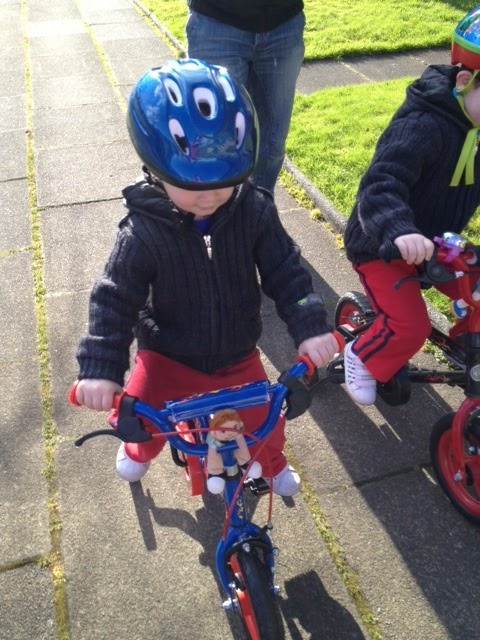 Tyler took Halfpipe Pete out on his bike a ride with him. Due to the magnetics he stuck on perfectly and Tyler was so proud to drive him around. The boys also had lots of fun playing football with them. We used a cardboard box as the goals. As you can see Halfpipe Pete isn’t too good at playing football. Who says dolls are just for girls? The Manhattan Boysterous dolls prove otherwise. These dolls were a big hit in our house both with the boys and my twin nieces. I’d highly recommend these to anyone, they are an affordable price of £14.95, they are well made, sturdy and a lot of fun. The fact they are poseable and magnetic adds to the fun. 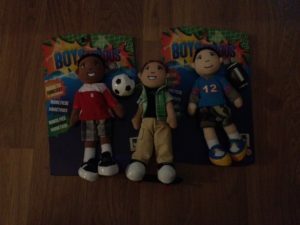 They are more aimed at boys, so if you have a boy who is desperate for a doll but your other half isn’t so keen then I’d highly recommend these. And if you have a girl who isn’t quite into the pink and sparkly barbies, then these are perfect too. All in all a great toy and would make a great present too. Check out the lovely Merry’s blog Patch of Puddles which is fantastic and the Play Merrily Toys Site for loads of toys and gifts perfect for every occasion.